DESCRIPTION -- Set of very early souvenir playing cards from the P&O Line which have been used but are complete and original from the shipping line. HISTORY -- The Peninsular and Oriental Steam Navigation Company, which is usually known as P&O, is a British shipping and logistics company which dated from the early 19th century. Following its sale in March 2006 to Dubai Ports World for 3.9 billion, it became a subsidiary of DP World; however, the P&O brand has been retained. The company was headquartered in London, in the United Kingdom; it was listed on the London Stock Exchange and was a constituent of the FTSE 100 Index. DESCRIPTION -- Very old handbook of information from the P&O Line which is from the 1800's and shows information on the fleets vessels and routes of passage. Although the item is in a fair condition and not excellent, it is important to remember how old it is and you would be unlikely to find another like it. DESCRIPTION -- Unused and as new this item is a luxury photo album from the fantastic cruise ship the Grand Princess from the Princess Lines Shipping Company. Being unused it is in a presentation box and the size of the item is 13" (34cm) square. Although not of ancient or old maritime value, to purchase this luxury album from onboard would cost alot more money than for sale here. HISTORY -- At 109,000 tons The Grand Princess is too wide to fit through the Panama Canal but her size allows her to offer passengers an unmatched number of outside cabins with balconies. Grand Princess is a Grand-class cruise ship owned by Princess Cruises. Built in 1998 by Fincantieri Cantieri Navali Italiani in Monfalcone (Hull Number 5956), Italy, at a cost of approximately US$450 million, she was the largest and most expensive passenger ship ever built at the time. DESCRIPTION -- Sealed pack of 12 souvenir matches from the famous old liner The SS Canberra which are of course unused and a genuine souvenir. There are several packs available should anyone be interested. HISTORY -- SS Canberra was an ocean liner, which later operated on cruises, in the P&O fleet from 1961 to 1997. She was built at the Harland and Wolff shipyard in Belfast, Northern Ireland at a cost of UK 17 million, and was launched on 16 March 1960. The ship was named on 17 March 1958, after the federal capital of Australia, Canberra, and entered service in May 1961. During the 1982 Falklands War, it served as a troop ship. DESCRIPTION -- Souvenir item from the P&O vessel the RMS Rajputana which is a silver-plated matchbox holder showing on the front the flag emblem and name of the great vessel which is in a good condition (Click on the picture for a close look at the emblem). HISTORY -- The RMS Rajputana was a British passenger and cargo carrying ocean liner. She was built for the Peninsular & Oriental Steam Navigation Company at the Harland and Wolff docks on the River Clyde near Glasgow, Scotland in 1925. She was one of the P&O 'R' class liners from 1925 that had the much of their interiors designed by Lord Inchcape's daughter Elsie Mackay. Named after Rajputana region of western India, she sailed on a regular route between England and British India. DESCRIPTION -- Mint condition as new souvenir tea towel from the famous old P&O Line vessel The SS Canberra which is dated from the early 1970's (click on the picture for a closer look at this item). DESCRIPTION -- Souvenir solid silver spoon from the P&O vessel The Iberia which is a very early piece and is in a great condition. 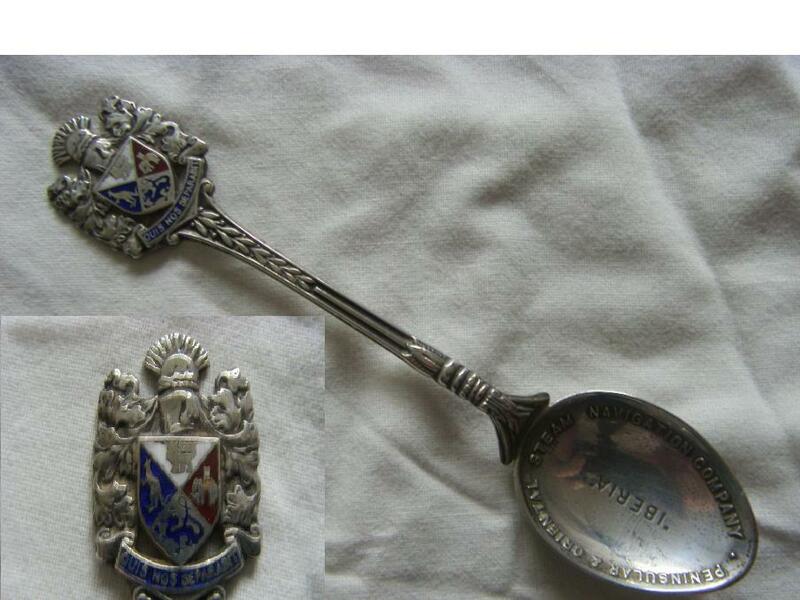 It has a full colour company flag at the head of the spoon and the size is 5" (12.5cm) long (click on the picture view for a closer look at this item and its crest and flag). HISTORY -- The SS Iberia was built by Harland & Wolff of Belfast in 1954. Her sistership was the Clyde-built Arcadia of the same year. They were easily distinguishable due to different funnel tops. The Iberia received serious damage in a collision with a tanker off Colombo, Sri-Lanka, in 1956. The tanker Stanvac Pretoria was running light, so damage was high above the waterline. Repairs were undertaken at Cockatoo Dockyard, Sydney. HISTORY -- The first Oriana was built in 1960 by Vickers-Armstrong's, Barrow. Ordered by, and registered to the Orient Steam Navigation Co, she was delivered to P&O Orient Lines with the distinctive Orient Line corn-coloured hull. She served on the route to Australia from Southampton (unlike earlier Orient Liners which sailed from London). In 1962 she collided with the carrier USS Kearsarge between San Francisco and Los Angeles in fog. Her hull was repainted white in 1965, when she was transferred to full P&O registry. DESCRIPTION -- Unused 1973 poster advert for the vessel The Spirit of London of the P&O Shipping Line which is in a mint condition and is as new. These type of adverts were usually designed to fit into the window of a travel agent of that period with the size being approx. 11" x 16" (30cm x 42cm). To find this type of poster is usually very rare but to find any posters such as this which have not been used is a tremendous bonus (click on the view link or on the picture for a closer look at this item). HISTORY -- Spirit of London was to have been a sistership to Norwegian Caribbean Line's Southward, to be named Seaward. Norwegian Caribbean Line pulled out of the deal after price rises following the Italian builders' nationalization, and the hull was sold to P&O. Spirit of London was eventually completed in the autumn of 1972. When P&O later acquired Princess Cruises in 1974, Spirit of London was transferred to that fleet, becoming the Sun Princess. DESCRIPTION -- Set of unused and unwrapped playing cards from the P&O Line shipping company. They are still wrapped in the original polythene and as new and come in an outer box, all being in excellent condition and are dated from around the 1960's. HISTORY -- Founded in 1836, the Peninsular & Oriental Steam Navigation Company, sailed from London to Spain, Portugal and the Mediterranean. The company began a service to Alexandria and an overland journey to Port Suez with a connection to India (not P&O at the time until 1840). The overland route was the quickest way to India. Passengers disembarked at Alexandria, and journeyed for 12 hours up the Nile to Cairo. Special shallow-draft vessels then carried them to Cosseir and passengers then travelled in mule drawn carriages to Port Suez.